Our High Performance Land Rover Defender Bi-LED Headlights with DRL are specifically designed for use with Land Rover Defenders. Our Plug and Play design enables quick and easy installation to your Defender in place of the original sealed-beam headlights. Only minor wiring work is required for Crescent Halo/DRL operation. Our Land Rover Defender Bi-LED Headlights with DRL offer 2280lm (High Beam) / 2040lm (Low Beam) and are easily adjusted using the standard Land Rover headlight adjustment bezels. 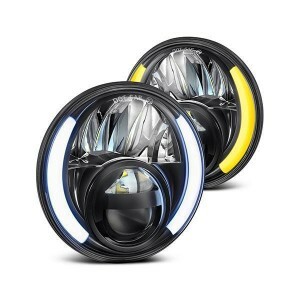 Instantly upgrade the look of your Defender with our road legal & E Marked LED lights. The Headlight Crescent Halos function as Daytime Running Lights (DRLs) when headlights are off and can also be set up in ‘switchback’ mode. Switchback mode enables the DRL to flash amber when the indicators are switched on and then ‘switchback’ to white halo when indicators are off.